The 2018 midterm elections were the most expensive in history, and much of the money that financed them was undisclosed, or “dark.” There has always been big money in elections, of course, and some of it has always been dark. In the first Gilded Age, all campaign contributions were made in secret. The presence of big and dark money in today’s elections, however, is not a continuation of old practices; it came about as a result of recent court decisions. Congress tried to curb big money at the tail end of the Gilded Age: it banned corporate money from elections in 1907 and brought campaign money into the light by passing the first disclosure law in 1910. Big donors and politicians opposed the reforms but complied with them once they passed. Presidential campaign committees began filing disclosure reports in 1912, and have been doing so ever since. Those reports reveal that disclosure caused another change: big donors immediately began writing much smaller checks. It is likely that some checks were still illegally laundered corporate contributions, but at least they were smaller. Apparently, billionaires and corporations both thought it was not a good idea to flaunt their wealth in public. The one percenters of the first Gilded Age might not have liked the new law, but they raised no ideological or constitutional objections. They adapted, grudgingly, to the new norms of a more open democracy. And big donors continued to write smaller checks into the 1960s — an impressive record for a law with no formal enforcement mechanism. But in 1968, twenty of Richard Nixon’s fundraising committees failed to file disclosure reports, and Nixon’s Justice Department didn’t prosecute them. In 1972, President Nixon solicited illegal corporate contributions and failed to report dozens of individual gifts that were the largest in half a century. These were the first large-scale violations of the disclosure law. The resulting Watergate scandal spurred Congress to pass more comprehensive reforms. This time, though, they did meet with ideological and constitutional objections. Conservatives could not defeat the reforms in Congress, but in 1976, they challenged them before a Supreme Court that had taken a right turn under Nixon. They based their challenge on a radical theory of the First Amendment: that political money is tantamount to political speech and has the same constitutional protection. They did not oppose disclosure, but they did oppose limits on contributions and expenditures. The justices accepted the conservatives’ First Amendment theory, but still upheld limits on contributions to candidates and PACs. Contributions were only second-hand speech, they said, and so had less constitutional protection. But they struck down spending limits because spending was “pure speech” and had full constitutional protection. That included third-party spending on behalf of candidates — called independent expenditures because they are supposedly done without the candidates’ cooperation. This was the key victory in what the challengers triumphantly called the “wreckage” of the post-Watergate reforms. It is through independent expenditures that contributions are getting bigger and darker today. That is because in 2010, the Court adopted an even more radical First Amendment theory. In Citizens United, it went against the 1907 law to hold that corporations have the same right as individuals to make independent expenditures. It is through independent expenditures that contributions are getting bigger and darker today. That is because in 2010, the Court adopted an even more radical First Amendment theory. Fortune 500 companies did not make such expenditures for fear of offending customers. But nonprofit corporations registered with the IRS as nonpolitical social welfare groups jumped at the chance. IRS rules let them make political expenditures as long as they spend most of their money on their nonpolitical goals. But there are ways around those rules, ways the IRS seems unable to block. And as non-political groups, they do not have to report the donors who finance their political spending. The IRS was immediately inundated with applications to form more such groups. Just weeks after Citizens United, the District of Columbia circuit court struck down the limit on contributions made to independent-expenditure PACs — a law that had been in force for thirty-four years. This decision created the super PAC, which can take contributions of unlimited size to make unlimited independent expenditures. But super PACs have to file disclosure reports. That was all right for the billionaires who now think it is a good idea to flaunt their wealth in public. And publicity-shy billionaires stayed in the dark by laundering their contributions to super PACs through the politically active social welfare groups unleashed by Citizens United. The first Gilded Age was a time of great inequality and disruptive social and economic change. But it was also the beginning of the urban industrial economy, with labor unions and other countervailing forces, that was the foundation for twentieth-century democracy. Now that old economy is crumbling. So is the old democracy and the campaign finance laws that were an essential part of it. Recently that crumbling has been accelerated as a matter of political policy. 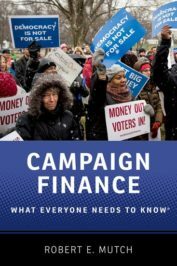 Dark money and super PACs are the results of the Supreme Court’s deliberate dismantling of campaign finance law. Today’s one-percenters are adapting to the norms of a democracy that is less open and more money-driven than at any time since the first Gilded Age. Featured image credit: Packs Pile Money by PublicDomainPictures. CC0 via Pixabay.